Sweaters are the must-have fashion staples for the winter time. They can be found in so many versatile styles and colors and can be part of versatile outfit combos. You can wear them with jeans and skirts, over shirts and can be decorated with a statement necklace. Today, we have chosen several street style looks to show you How To Wear A Statement Necklace With Sweater and we hope that you will like them. The statement necklaces have the power to instantly change any plain look. They can be found in so many versatile designs and colors, so you will for sure find the right one for you. They are perfect for monochromatic outfits, but can be also worn with some patterned sweaters. Layering your collared shirt and your sweater is perfect combo for the office, so why wouldn’t you spice it up with some necklace underneath the collar. Statement necklaces are perfect choice for plain sweaters, but also feel free to wear them with some textured or printed sweaters. You should choose the necklace to be in the same color as the sweater, but a darker shade so that it can be noticed. Or you can choose a necklace in some contrasting and more vibrant shades and thus make a bigger statement. And when it comes to the design, you have a choice to make between versatile rhinestone, chain, tassel or studded necklaces, collared or layered ones. Turtlenecks are just some of the many types of sweaters that you should wear this winter. You can wear them plain or you can also spice them up with some beautiful necklace. If you choose some short collared necklace, opt for some bold, thicker one so that it can stand out. Also, you can wear long statement necklaces, with several layers, which are getting quite popular this season. Choose them to be in some contrasting color, so that they can stand out and make the monochromatic outfits look less boring. Statement necklaces can give a new look to any outfit. Wearing them with sweaters is one of the fashion trends that should follow this winter. 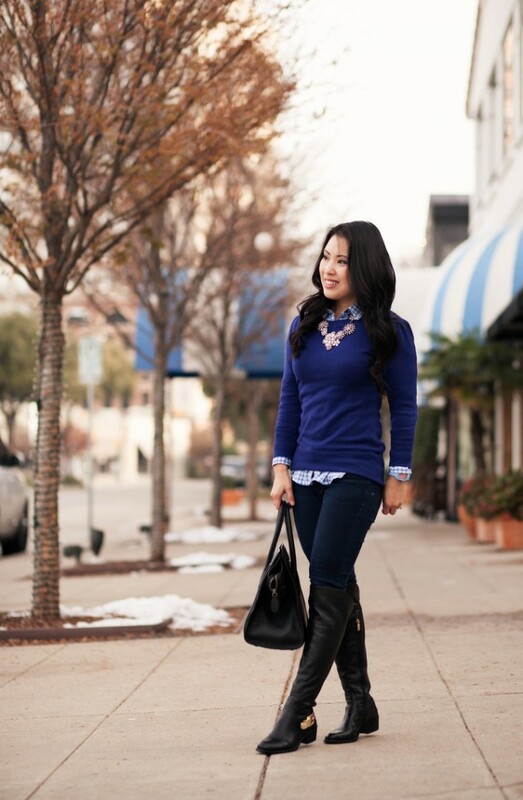 The above street style looks are just some of the many ways to wear such necklaces with sweaters. Tell us in the comments which one from the above looks would you like to copy and of course, don’t forget to stay up to date with the content of Fashionsy to find many other stylish outfit ideas for your inspiration.